Mary Beard and Question Time – Clash, Discussion or Dialogue? Following the appearance of Mary Beard on the BBC’s Question Time broadcast from Lincoln on 17 January 2013 there has been an outbreak of largely anonymous abuse, directed at the Cambridge University Professor of Classics, originating from discussions which took place on the programme. The website ‘Don’t Set Me Off’ which included some particularly offensive comments has subsequently been closed down by the website moderator who commented that friends and colleagues of the academic had been “trolling” his site and bombarding it with Latin poetry. He also commented that Beard ought not to seek to curb freedom of speech. Beard suggested that it was desirable to have a consensus on appropriate behaviour for on-line postings and that the nature of boundaries regarding what is acceptable should be considered. 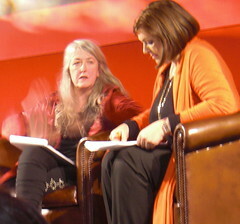 As well as reflecting on the personal impact of the abuse on Mary Beard, a number of more general issues arise from these incidents and are perhaps worth considering: the relationship between the comments and the debate which actually took place; the quality and accuracy of reports on the debate made by sections of the press; the reasons which underscore the various controversies created by the programme; the potential inhibition of democratic debate and the willingness of individuals to place their heads above the parapet in a public forum of this type. What was the nature of the original debate? I both attended the event in Lincoln and watched a recording of the broadcast, and recollect that the panel responded to a question about the ability of public services in the area to accommodate increases in population resulting from immigration. Lincolnshire has a relatively large number of migrants from Eastern Europe, seeking employment primarily in the food harvesting, processing and packaging industries which predominate in parts of the county. Mary Beard quoted from Social Impact and Population Change (2012) a document produced by Boston Borough Council which described services as being able to cope. An audience member indicated that a relative who was a midwife would disagree with this. She went on to outline ways in which she felt that immigration had caused deterioration in the quality of life in her town. Mary Beard responded, again with a quote from the document that without the increase in birth rates from migrants the hospital maternity unit would not be viable. In essence the issue originated with an apparent contradiction between a local authority’s view, as summarised by Mary Beard, and that of an audience member who lived in Boston and hence spoke from actual experience. The discussion was reported by the press in various terms with the Daily Mail outlining the audience member’s comments in more detail. It did not however mention the Boston Borough Council document, the result of a substantial series of consultations with all sections of the community. Nevertheless in a later article in which Mary Beard was interviewed the Daily Mail provided a more balanced overview. Perhaps the Independent’s comment on how the issue reflects the perceived ‘gulf between the intellectual leaders of “liberal Britain” and those who feel alienated by their pieties’ is most apposite. Certainly the comments in all sectors of the press are full of implications about left-leaning academics out of touch with the real world. The issue of evidence, of the accuracy of the data on which Boston Borough Council made their conclusions, and of the rigour of the Council’s conclusions seem to have been lost. Rigorous analysis of significant issues is not typical of programmes such as Question Time. Whyte (2003) warns those disturbed by logical error to avoid this programme because it is a ‘noxious environment’. He would be particularly critical of much on-line comment. One expects journalists, however, to use their experience of assessing information sources in order to scrutinise data and conclusions for accuracy. Levenson placed journalistic practices under the spotlight yet pandering to prejudice and stimulating public appetite for the 21st century equivalent of bear-baiting seem to underscore the press on this issue. Bohm (1996) provides insights on the causes of the various perceptions evident when exploring this event, in particular by analysing the effects of attitudinal assumptions on perception. He contrasts communication with dialogue and suggests that ‘participatory consciousness’ is required if society is to move towards true understanding, and ultimately towards a coherent society. What does this mean in practice? He warns us that holistic perspectives may not be comfortable, but that it is important to consider the deep underlying assumptions which colour one’s own perceptions of ‘reality’ and more significantly those of people with whom we disagree. Ultimately, he argues, opinions will not matter (there is no point in convincing or persuading if something is evidently right) if there is a movement towards common meaning. At this point creative solutions can occur. Even where personal participation in dialogue is not possible, Bohm argues that dialogue between ‘our thought and their thought’ will elicit order. Bohm’s analysis emphasises ‘awareness’, ‘softening up’ and ‘opening up’ as precursors of this perceptual shift. This is an uncomfortable analysis and perhaps one which is too idealistic for many. Bohm’s interest in word roots (‘dialogue’, ‘discussion’, ‘convince’, ‘persuade’) are full of insight and encourage one to make associations. ‘Compassion’ comes to mind, the idea of empathy which is more deeply rooted in the idea of ‘suffering with’. I am reminded of the discussion which took place prior to the Question Time broadcast when at least three participants – panel and audience made the point that this was a Christian country. My raised hand was not picked out by the Chair so I did not have the opportunity to deliver the argument that this was a multi-faith and no-faith country, but nevertheless one whose social values were deeply informed by Christianity. One hopes that such values do inform compassionate debate, or even Bohm’s dialogue, by whatever means but particularly through those which provide opportunities for anonymous and misogynistic abuse.